Use Google to search this site. --- CogAff Project Overview (this page). Also incorrect uses of "types of Xs" replaced with more logical "types of X"
Separate file listing main contents of this site. More detailed list of aims and topics. (Separate web page). CoSy project papers and presentations. Miscellaneous notes and discussion papers. Meta-Morphogenesis: How could our minds and the rest of life have come from a cloud of dust? "Could a baby robot grow up to be a mathematician?" A large and growing collection of discussion papers, frequently revised or extended. The rest of this web page gives a high level overview of the Cogaff project and related projects. It includes a roughly chronologically organised collection of papers since the 1960s grouped by year of addition to this web site. There are also links in the table below to projects that overlap with CogAff, including, since 2004, collaborative projects in Cognitive Robotics (CoSy 2004-2008, CogX 2008-2012). Now too many to list here! Apology From time to time the central university authorities reorganise campus web pages, without taking action to ensure that references to old links are trapped and redirected. This is a common problem on university web sites. As a result there are probably several broken links on this web site. If you find any link from or to the CogAff site that does not work, please let me know, at a.sloman[at]cs.bham.ac.uk Thanks. Many researchers propose a theory of THE right architecture for a system with some kind of intelligence (e.g. human intelligence). Although this may be an appropriate way to address a specific technical problem, it is seriously misguided, if done as a contribution to our scientific or philosophical understanding, unless the specific architecture is related to a theory about THE SPACE of POSSIBLE architectures for various kinds of intelligent system. Such a theory would need to include a survey of the possible types of component, the different ways they can be combined, the different functions that might be present, the different types of information that might be acquired and used, the different ways such information could be represented and processed, the different ways the architecture could come into existence (e.g. built fully formed, or self-assembling), and how various changes in the design affect changes in functionality. Such a theory also needs to be related to a study of possible sets of requirements for architectures (and for their components). If we don't consider architectures in relation to what they are used for or needed for (in particular types of context) then we have no way of explaining why they should have the features they have or what the trade-offs between alternative design options are. These investigations should not be restricted to physical architectures. Since the mid-twentieth century human engineers have increasingly found virtual machine architectures, in which multiple virtual machine components interact with one another and with physical components. It seems that biological evolution "discovered" the need for virtual machinery, especially self-modifying and self-monitoring virtual machinery, long before human engineers did. This and other "discoveries" by natural selection, and its products, are investigated in the Meta-Morphogenesis project. 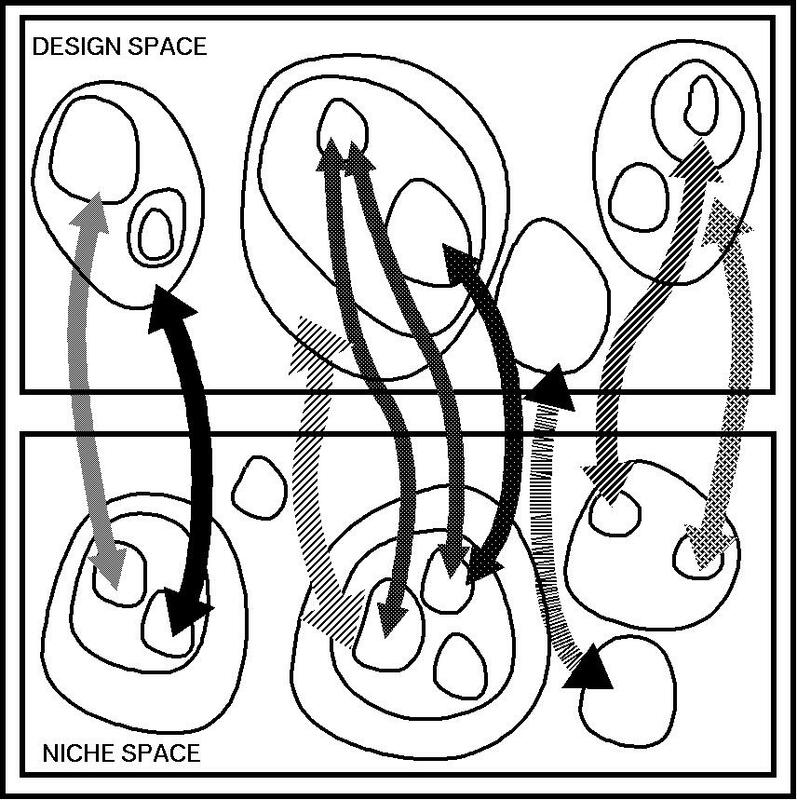 The space of possible designs for architectures (design space): (what sorts of design options are available at various stages in the evolution of more complex designs and in various environments?). The space of possible sets of requirements for architectures (niche space, since a niche is a set of requirements) is distinct from, but related to the space of possible designs. suited to instances of sets of requirements (niches). How various architectures, mechanisms, and forms of representation meet, or fail to meet, or partially meet, the various sets of requirements against which they can be evaluated. This includes investigating tradeoffs among the alternatives. The requirements that led to different sorts of virtual machinery and the various designs for such virtual machinery, including evolution of "protocols" for interactions of various sorts between components, between hardware systems, between virtual machine sub-systems, ... the origins of internally self-directed conscious states and the discovery of qualia, and other mental phenomena supported by virtual machinery. Virtual-machine functionalism. Ignoring the variety in these spaces, and instead proposing and studying just ONE architecture (e.g. for an emotional machine) is like doing physics by finding out how things work around the leaning tower of Pisa, and ignoring all other physical environments; or like trying to do biology by studying just one species; or like trying to study chemistry by proposing one complex molecule for investigation. That's why, unlike other research groups, most of which propose an architecture, argue for its engineering advantages or its evidential support, then build a tool to build models using that architecture, we have tried, instead, to build tools to explore alternative architectures so that we can search the space of designs, including trying to find out which types evolved and why, instead of simply promoting one design. Our SimAgent toolkit (sometimes called "sim_agent") was designed to support exploration of that space, unlike toolkits that are committed to a particular type of architecture. Some videos of toy demos mostly produced in the 1990s can be found here. The latest version is also freely available, with a "Creative Commons" licence. Chapter 7 on "Intuition and analogical reasoning", including reasoning with diagrams, and Chapter 8 "On Learning about Numbers" were specially closely related to the 1962 DPhil work on the nature of mathematical knowledge. After AS moved to Birmingham, the work was partly funded by a grant to Sloman and Humphreys, from the UK Joint Council Initiative (JCI), which paid for a workstation and a studentship. An additional studentship was funded by the Renaissance Trust (Gerry Martin). Later PhD students who built on and extended the ideas are listed here (with online theses). In particular a paper summarising some of the key ideas in the context of long term grief, including phenomena that refute many theories of emotions/affect was published (by invitation) in the journal Philosophy Psychiatry and Psychology in 1996 http://www.cs.bham.ac.uk/research/projects/cogaff/96-99.html#2. Later extensions arose from funding by DERA which enabled Brian Logan to work here for several years, followed by a project funded by The Leverhulme Trust on Evolvable virtual information processing architectures for human-like minds, originally set up with Brian Logan, which then paid for Matthias Scheutz to work here for 13 months (2000-2001), followed by Ron Chrisley (2001-2003). A progress report on the CogAff project was written in 2003 (separate document). From 2004 related work was funded by the EU, in two projects on cognitive robotics CoSy and CogX. For a while some of the work was done as part of the Intelligent Robotics research laboratory (led by Jeremy Wyatt) at Birmingham. However, the externally funded projects, partly under pressure from collaborators had to focus on more specific targets and techniques, so the more theoretical work reported here, and in the Meta-Morphogenesis project spawned around 2012, continued mostly independently, though with potential implications for future ambitious robotic projects. In 2004, Jackie Chappell arrived in the School of Biosciences (having previously worked in Oxford, in the Behavioural Ecology department led by Prof Alex Kacelnik). Our ways of thinking about intelligence in animals had significant overlap so we worked together on extending biologists' ideas about "Altricial" and "Precocial" species to robots and investigating nature-nurture tradeoffs in animals. CogAff is really a loose, informal, collection of sub-projects, most of them unfunded at any time, including research on architectures, forms of representation and mechanisms occurring in humans, other animals, and human-like machines. Some additional topics covered can be found in this document compiled in 2009 and this list of online discussion papers (frequently extended). Analysing such architectures, and the mental states and processes they can support, allows us to investigate, for instance, whether consciousness or the ability to have emotional states is an accident of animal evolution or a direct evolutionary consequence of biological requirements or a side-effect of things meeting other requirements and constraints. One of the outcomes of this research was development of the CogAff schema introduced above and (explained briefly in this poster). The schema (especially when elaborated beyond those simple diagrammatic specifications) is a high level abstraction that can be instantiated in many different special case architectures. This provides a way of characterising a wide range of types of possible architecture in natural and artificial systems (in contrast with most researchers on cognitive architectures who promote a particular architecture). A special case (or subclass) of CogAff is the H-CogAff (Human-Cogaff) architecture, described below, which is still currently too difficult to implement, though various subsets have been implemented by researchers here and elsewhere. Some "toy" versions are used in demonstration videos of student programs running. 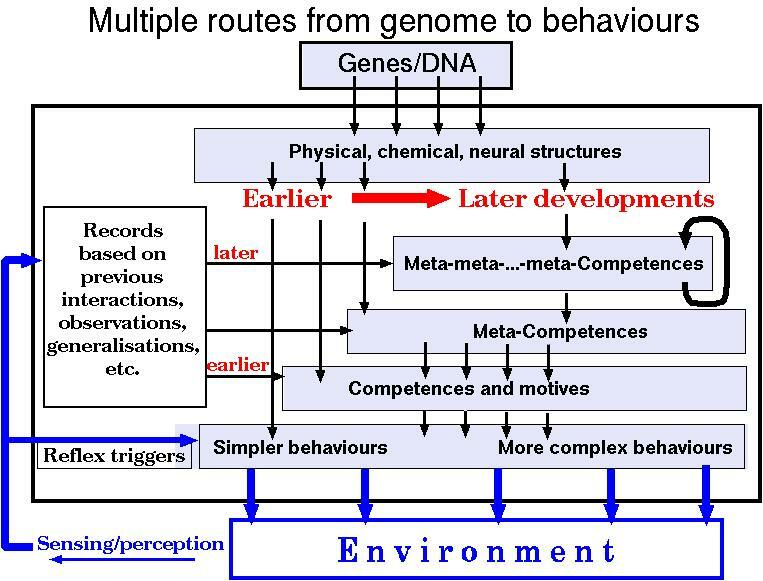 One of the implications of those ideas is that the information processing architecture of an organism can change during development in ways that depend on the influence of the environment -- insofar as the environment can influence how the genome is expressed, as indicated roughly in the above diagram. This is one of the themes of the Meta-Morphogenesis project mentioned several times in this document. Natural architectures evolved to fit many different biological niches. We need, but don't yet have, an agreed conceptual framework for describing both architectures and requirements/niches. 2.b Newer deliberative processes able to represent what does not exist but might, e.g. future actions, unseen situations, past causes. By superimposing the above two classifications we get the following suggestive, but in some ways misleading, 3x3 grid of possible types of architectural component, misleading because not all the required mechanisms will fit into just one of the boxes. The CogAff schema shown above summarises this space of possible types of architectural component. -- The first three divisions above (1.a--3.a) correspond to the vertical divisions in the schema. -- The second three divisions above (1.b--3.b) correspond to the horizontal divisions in the schema: evolutionarily oldest functions in the bottom layer. 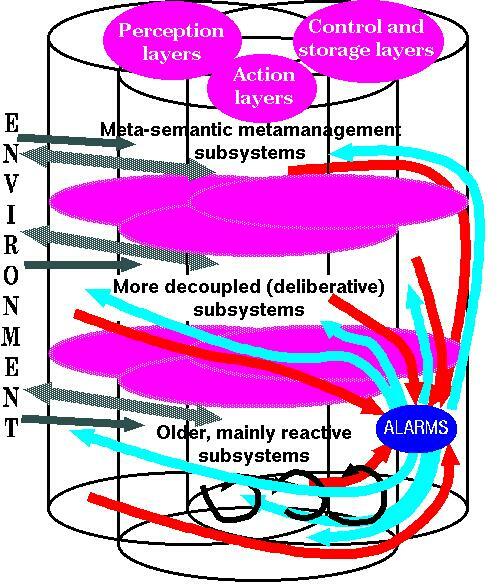 This is an over-simplification (a) because each layer should be more finely divided into components performing different functions, (b) because the columns and layers should overlap more (as in the diagram below), and (c) because there are mechanisms that straddle, or link components in, the various boxes in the diagram, including the "alarm" mechanisms that can play a role in emotions and other affective states. A revised (but still inadequate) version of the diagram is presented below. Jonny M and Dani L talk about AI architecture and Sloman. This appears to be an assignment for a course on "Perspectives on Artificial Intelligence, Robotics, and Humanity", in The Department of Computer Science and Engineering at the University of Notre Dame. 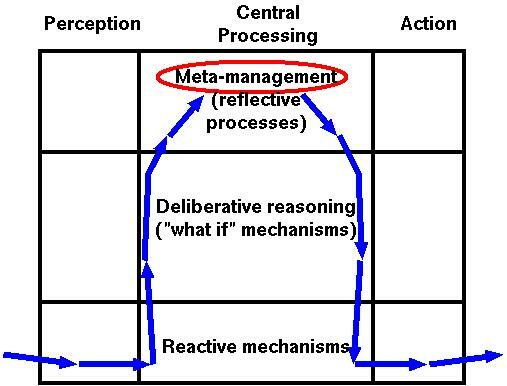 The previous diagram does not make it clearer that perceptual and action/motor mechanisms overlap. E.g. (as J.J.Gibson pointed out in The Senses Considered as Perceptual Systems (1966)), mechanisms of vision depend on the use of saccades, head movement, and whole body movements, and haptic sensing depends on controlled movements of hands, tongue, lips, etc. The following diagram is an attempt to remedy this deficiency in the previous diagram (and other CogAff diagrams). Note: the above diagram does not show the "alarm" processing routes and mechanisms described below. There are additional complexities not shown in the above diagrams, including the architectural decomposition at each layer, the complex sub-architectures straddling layers, e.g. for several different kinds of long term memory, for vision, for behaviour initiation and motor control, for language use, for learning, for many kinds of motivation, for personality formation, for social and sexual interaction, and many more. NB A Schema for architectures is not an architecture. It is more like a grammar. Instances of the schema are like sentences in the grammar. However the CogAff schema is a grammar whose 'sentences' are not strings but quite complex networks of concurrently active mechanisms with different functions, as discussed in this paper on Virtual Machine Functionalism (VMF). Many organisms seem to have, and many robots and other intelligent machines will need, an "alarm" mechanism, which receives input from many of the internal and external sensors and is capable of recognising patterns that require very rapid global reorganisation of ongoing processes, for example switching into states like fleeing, attacking, freezing, or attending closely to what may or may not be a sign of serious danger or some opportunity. This kind of mechanism seems to be very old in animal evolution and can be observed in a woodlouse, for example, when it reacts to being touched by rolling itself up in a ball, or a fly which reacts to the rapid approach of a fly-swat by stopping whatever it is doing (e.g. feeding) and switching to an escape action. 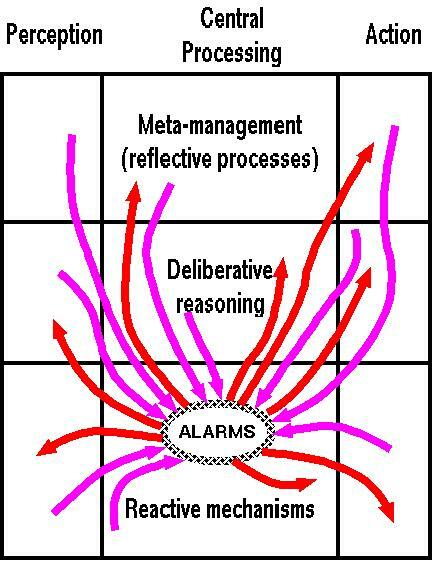 Whether the outputs from the alarm system actually interfere with other subsystems or merely have a tendency to interfere, but fail to have an effect (we use the label "perturbance" to include these dispositions to perturb or disturb, which may be real but ineffective, or partially effective, etc. Many theories of emotion (especially theories that over-emphasise bodily states, or action tendencies, like the James-Lange theory and its many derivatives) imply or state that an individual can be in only one emotional state at a time, whereas this architecture allows several different sorts of perturbance to coexist, including different sorts. It is also possible for an enduring state to be temporarily dormant, as in grief or jealousy. We do not claim that humans are born with such an architecture fully developed: it obviously grows over time. (A newborn human infant is incapable of feeling despair at the long term effects of human population growth.) That implies that at different stages of development different affective states are possible, including different emotions. Primary emotions: involving only mechanisms at the reactive level. Secondary emotions: involving some mechanisms at the deliberative level (in addition to reactive mechanisms). In addition there are many affective states and processes that are not emotions, including desires, preferences, intentions, attitudes, ambitions, moods,..., and probably many more components of the architecture in different species. A symptom of that educational inadequacy is attempting to find a few "dimensions" in which features of emotions can be classified and then taking the resulting 2 or 3 (or sometimes higher) dimensional grid as providing a principled classification of emotions. But complex information processing systems can get into states that vary in far more complex ways than such simple-minded tables or graphs can accommodate: as any system designer knows. 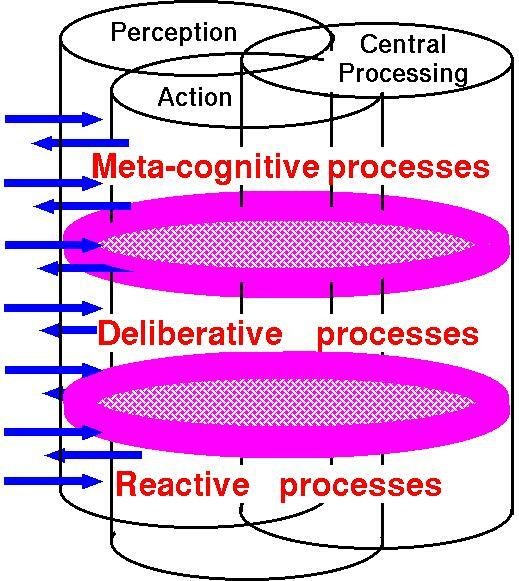 An insect-like special case of the CogAff schema is purely reactive -- none of the deliberative or meta-management functions are provided, though reactive mechanisms may be layered, as indicated crudely in the diagram. [Modified: 7 Dec 2012] A purely reactive system that always merely reacts to particular stimuli could be modified to include "proto-deliberative" mechanisms (unfortunately labelled "deliberative" by Michael Arbib at a conference in 2002). 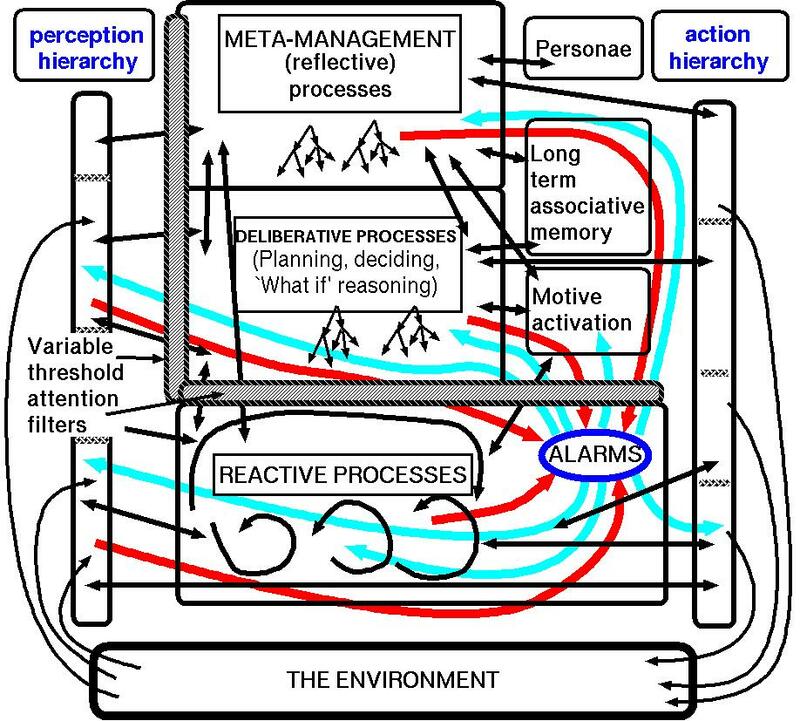 In a proto-deliberative system, reactive mechanisms can simultaneously trigger two incompatible response-tendencies. Since in general a blend of two incompatible responses is worse than either response, it can be useful to have mechanisms for choosing one of them, e.g. using a comparison of strength, or some other mechanism such as always letting escape reactions win over feeding reactions, or using a self-organising neural net capable of achieving a variety of potentially-stable states, then adopting one. For more more on different intermediate cases see this discussion of "Fully Deliberative" systems. In such a (relatively) simple architecture, alarm mechanisms can trigger simple emotions (e.g. in the woodlouse that rapidly curls up in a ball if touched while walking). Architectures of this general type where the flow of information and control can be thought of as roughly like the Greek capital letter Omega Ω (not necessarily presented in this sort of diagram) are often re-invented. The assumption is that perception consists of detection of low level physical signals that are processed at increasing levels of abstraction until the processing generates new goals or preferences, at which point some selection mechanism (e.g. contention scheduling) chooses the best motive or action and the then signals propagate downwards to the motor subsystems which then produce behaviour. This "peephole" (or "peep-hole") view of perception and action contrasts with the "multi-window" view of both perception and action as involving concurrent processing at different levels of abstraction, partly under the control of the environment and partly under the control of various layers of central information processing, operating in parallel. So some of the more abstract perceptual or motor processing can be thought of as both cognitive insofar as they make use of forms of representation and ontologies shared with more central processing mechanisms, and also as peripheral (e.g. 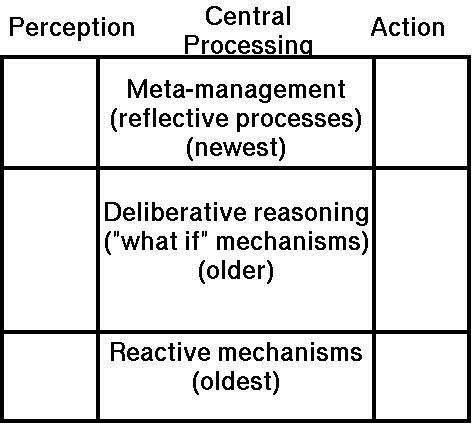 perception or action processes) because the information structures used are maintained in registration with perceptual input signals (or the optic array in the case of visual input) or in registration with motor signal arrays, and also because the processing at those more abstract levels is bi-directionally closely coupled with the lower level perceptual or motor signals. These extra layers of perceptual or motor processing are fairly obviously needed for language production or perception because it is now well understood that linguistic expressions have structures at different levels of abstraction that all need specialised processing. Our claim is that that is a special case of a far more general phenomenon (as illustrated in the POPEYE program described in Chapter 9 of The Computer Revolution in in Philosophy 1978). A poster summarising some of the main theoretical ideas is here (PDF). Some dimensions in which architectures can vary were presented at the Designing a Mind Symposium on in 2000 in "Models of models of mind." However, that paper is inadequate in several ways, e.g. because it does not clearly distinguish the CogAff schema from the H-CogAff special case, presented briefly below. This Schema, as explained above, classifies requirements for the major components of an architecture into nine broad categories on a 3x3 grid which can be connected together in different ways (depending on how various kinds of information - factual information, queries, control information, etc, flow between subsystems). This is just a first crude sub-division, requiring more detailed analysis and further decomposition of cases (as illustrated here). However it does cover many different types of architecture, natural and artificial, depicted rather abstractly above. The generic CogAff schema includes an important sub-class of architectures that include mechanisms capable of producing what might be called "emotional" or "alarm" reactions, as shown in the "insect-like" special case, above. A paper summarising the ideas behind the CogAff schema and the H-CogAff architecture is this 2003 progress report on the Cogaff project. Why the recent over-emphasis on embodiment has held up progress (2008). An incomplete survey of types of architecture that include various types of "deliberative layer" can be found in "Requirements for a Fully Deliberative Architecture"
Some designs described as "deliberative" by other authors include only what we call "proto-deliberative" mechanisms. Most of the hypothesised architectures are still too difficult to implement though some of the simpler ones have been implemented using the SimAgent toolkit, and demonstrated here. More complex examples were developed within the EU-funded CoSy robot project (2004-2008), and are being extended in its sequel the CogX robot project (2004-2012). Tutorial presentations of how ideas like "qualia" and some of the vexing problems of consciousness ("the explanatory gap") can be understood in this framework are presented here. In 1998 Gerd Ruebenstrunk presented some of our ideas for German readers in his diploma thesis in psychology on "Emotional Computers" (Bielefeld University, 1998). See especially sections 9 and 10 of his thesis.. His 2004 presentation on emotions, at a workshop on "Affective Systems" (in English) is here. The nature of conceptual analysis. led by the Schools of Psychology and Computer Science, was approved by the University in 2009. We also interact with Philosophers here and elsewhere. There are overlaps with research in several other research groups in The School of Computer Science. Draft list of papers and presentations on requirements for human-like AI systems, robots, etc. Readable online in HTML and PDF formats. Also available as a complete PDF book. This 1978 book is available online free of charge, in a new electronic edition 2015, under a Creative Commons licence. to our work on varieties of architecture, as reported here. (who would be doing AI if he were alive now). Imre Lakatos. See a summary of his philosophy of science. (mostly in German), chaired by Maximilian Schönherr. The audio link is on the right, under 'AUDIO ON DEMAND'. Click on 'Emotionale Agenten'. demonstration movies of the Simagent Toolkit. workshops/conferences have begun to address this problem in a promising way. Comparative Repository of Cognitive Architectures, Models, Tasks and Data. By Bill Lemon, David Pynadath, Glenn Taylor and Bob Wray. Requirements for a Fully Deliberative Architecture. Discussion note on some possible architectural sub-divisions. (in humans, other animals, and machines). Computers and emotions, synthetic agents and emotions. Evolvable architectures for human-like minds. Ontology, including how a young child or robot needs to develop the ontologies it uses. the latter a mixture of preconfigured and meta-configured competences. Online versions of presentations given since 2001. A large and growing collection of discussion notes. Work related to the project, since about 1962. The Free Poplog web site with tools, teaching materials and demonstrations. AISB'06 Symposium on Grand Challenge 5: Architecture of Brain and mind. Including a draft version of his 2006 book The Emotion Machine, which overlaps with much of the work done here, on architectures, forms of representation, philosophy of AI and varieties of affect, but focuses on a single architecture. Original version was in AISB Quarterly, January 2012.
the AISB'00 Convention at the University of Birmingham 17-20 April 2000. Visions of Mind: Architectures for Cognition and Affect. one of the pioneers of AI in the UK, who died in 1981. His ideas played an important role in the early development of this work. in this School, see the School's study opportunities web page. Please read that file information BEFORE writing to individuals asking for advice or information. Please note: I do not deal with student admissions. Being retired, I am also no longer able to supervise PhD students. The Birmingham Centre for Computational Neuroscience and Cognitive Robotics. This work, and everything else on my website, is licensed under a Creative Commons Attribution 4.0 License. If you use or comment on my ideas please include a URL if possible, so that readers can see the original, or the latest version.